A homeowner in Odenton, MD needed to have some siding repairs done on their home. Our crew replaced the siding at the second floor gable. The work looks great and they cleaned up the area - hauling away all trash. We treat your property like it was our own! 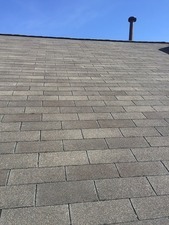 A homeowner in Odenton, MD needed to have some repairs done to the roof of their home. After contacting Integrity Home Pro - our crew went out to assess the damages. They ripped up the old roofing material and began to replace it with new material and shingles. Nikki from Odenton, MD, had initially found Integrity Home Pro on Angie's List as a Highly Recommended Company. Several remodeling projects later, she was still calling Integrity Home Pro for all her home repair and remodeling projects- large or small. This time, she was ready for a replacement entry door. The existing door was old and no longer closed easily. She wanted to upgrade to something with more modern materials that was also energy efficient. Whether you have a large or small remodeling or home repair job, prepare to be amazed by the Integrity Crew. We deliver excellent work in a timely manner, by a crew that wants to make YOU happy. Integrity Home Pro is a great roofing, siding and remodeling company serving the greater Chesapeake Bay area including Odenton, MD. We are the contractor with Integrity and have many previous customers who trusted us to complete their home project too. Read more about us below and contact us when you're ready to start your free estimate. We have a leak in the roof that has left a spot on our bedroom closet ceiling. Neighboor had similar issue - was caulking/flashing problem. Could you visit, take a look, and provide an estimate? Thanks! Would like a Quote on a Front Entry Door. Also if you do roofs I would like a Quote on doing the roof if you do back to back townhouses which only have a half of a townhouse roof. New roof damage loose shingles on ground and flashing damage. We have a leak in our roof that's causing visible damage in our guest bedroom on the 2nd floor of our townhouse. Roof is approximately 3 years old but there is a satellite dish from the previous owners in the vicinity of the leak. I work nights, so if I don't answer when you call please leave a message and I'll call back when I am awake. Looking for a honest roofing company with plenty of integrity to provide me with a quote to replace my roof in Piney Orchard in Odenton. Several exterior home repairs. I have a 3 level townhouse. 1) A hole in vinyl siding in the rear of the house. 2) Exterior caulking 3) Front door frame wood repair. 4) Repainting of window shutters and door. "... there is an enormous improvement in the operation and quality over my previous windows... The sales process was no pressure and the installation crew did an amazing job!" James heard about Integrity because all of his neighbors had them complete their projects. Integrity recently installed new Alside windows and sliding glass doors in my home. The first night that the windows/doors were installed I noticed a big difference. Previously I could hear vehicles passing behind my home ( there is a small stand of trees before one gets to a major through street); after the installation I wondered what had happened to all the traffic until I looked out the window and saw headlights going by, but did not hear the cars themselves. On occassion I can hear muffled noise (loud trucks, etc) but there is a distinct difference in the amount of noise that passes through these windows. The windows and doors are a great value - there is an enormous improvement in the operation and quality over my previous windows and they look great! The sales process was no pressure and the installation crew did an amazing job! And there is an additional bonus - the Federal Energy Tax credit. My thanks to everyone involved in the process. I love my new front door! The quality of the materials was better, price was competitive and your reviews were outstanding. The two competitors we looked at had reviews that indicated they tried to charge more for extras or other repairs during the job and their estimates confirmed that. Your salesperson Jerry clinched it. He was very knowledgeable and he was honest. That's hard to find in your business sometimes. "We had a leak in our dishwasher and had to replace kitchen..."
Integrity Home Pro provides all our customers the highest quality roofing installations throughout Odenton. Potential warning signs of a roof problem may be if you notice wood rotting, structural damage, impacts from ice or hail, shingle tearing, and damage, ice damming. Our decades of experience in Odenton allows us to fix your roofing issues quickly, efficiently, and with the quality and expertise you'd expect from a certified roofing company like Integrity Home Pro. We stand by our 5 Layer of Protection Guarantee which helps protect you, the homeowner should a manufacturer leave you out in the cold for value-added when working with us. To get started just call us at 1-855-202-7142 or email us today! The side lights are now exposed and let light in while still giving the family privacy. There are blinds for the side light. Those are unfashionable now a days. Wow! The door is now a rich blue and has a full glass door.